Friends of Kids with Cancer | Missouri Athletic Club takes a big swing for area children! Missouri Athletic Club takes a big swing for area children! The Missouri Athletic Club's Charitable Society put on a tennis exhibition between club members and local tennis pros to raise money for local children's charities. The event, which took place at the MAC West campus, raised over $1800! The Charitable Society recommends three local, nondenominational children's charities each year to be supported by the Missouri Athletic Club and its staff, which is then approved by their Board of Directors. Multiple events, just like the tennis exhibition, are held throughout the year. The final total raised is then divided up between the three great organizations. This year, the honored recipients are: Friends of Kids with Cancer, Good Shepard School and the Guardian Angel Settlement Association. 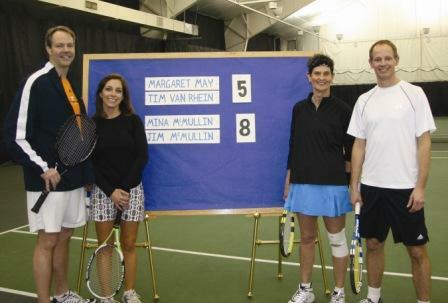 In the first match, Jim and Mina McMullin won a hard-fought contest of mixed doubles against fellow members Timothy Van Rhein and Margaret May. The second match featured Club pros Scott Stutz and Mac McDonald taking on Gregg Hammann, the Club Singles and Co-Doubles Champ, and Rich Striler, Co-Doubles Champ. This was a less testy affair, and although the Club members put up a good fight early on, the pros took over and won by a comfortable margin. 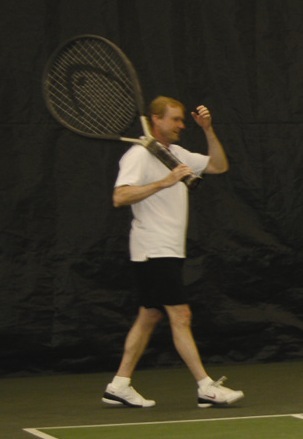 In the spirit of competition, the Club members pulled out all the stops, which included some novelty sized rackets seen to the right that delighted the crowd despite the losing the point on that volley. Most importantly, they raised money for three important children's charities that directly help the St. Louis community. Thanks to the Missouri Athletic Club, and stay tuned for more events from them throughout the year!